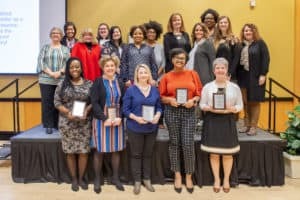 Franklin College’s Office of Diversity & Inclusion recently hosted the annual Women of Distinction Awards Breakfast in celebration of National Women’s History Month. The event, in its fourth year, is a celebration of women who have achieved, overcome and blazed a trail for other women through their professional leadership, volunteer efforts and civic and campus involvement. Members of the Franklin College community are invited to submit nominations to honor women in each of the four categories: students, alumni, faculty/staff and community members. The nominees are then judged by a panel and a winner is selected in each category. All nominees were recognized at the breakfast and each received a certificate and a ‘Women of Distinction’ leather portfolio, while the winners were honored with a plaque. Fellow student nominees included: Megan Battles, daughter of Steve and Margaret Battles of Shelbyville; Alexis Cheatham, daughter of Riley and Jill Cheatham of Indianapolis; Erica Irish, daughter of Eric and Charise Irish of Indianapolis; and Samantha Loyd, daughter of Ms. Jessica McIntosh of Indianapolis. Fellow alumnae nominees included: Angela Coy, of Franklin, is a 1997 graduate of the college. She is a CPA at Compass Pointe CPAs; and Mary Beth Hensley, M.D., of Franklin, is a 1996 graduate of the college. She is chief of family medicine with Major Health Partners in Shelbyville. Fellow faculty/staff nominees included: Hannah Adams Ingram, of Franklin, campus minister; Ann Barton, of Greenwood, assistant director of the Pulliam School of Journalism and special events assistant to the Office of the President; June Henderson, of Indianapolis, human resources director and Title IX coordinator; and Kelli Jones, of Franklin, assistant registrar. Fellow community member nominees included: Lisa Linter, of Franklin, director of the Library Services Center for the Johnson County Public Library system; Heather (Coyle) Montgomery, of North Salem, director of older youth services programs for the Children’s Bureau and a 2011 graduate of Franklin College; Ashley Reagan, of Camby, community outreach educator at ASSIST Indiana; Kathy Stolz, of Franklin, self-employed writer and speaker; Sonya Ware-Meguiar, of Beech Grove, CEO of Girls, Inc. of Johnson County; and Nichole Wilson, of Indianapolis, vice president of Retail Health Services, Community Health Network Indianapolis. The public celebration of women’s history in the United States began in 1978 as “Women’s History Week.” In 1987, Congress expanded the celebration to a month and March was declared Women’s History Month.